I fell into my yogic journey in my teens whilst living in Germany, I couldn’t speak the language, but I knew there was something special there. Those first memories of turning in and experiencing moving meditation are something that I aim to draw on in every class I teach. Yoga has since followed me around the world on my journey of self-exploration where I’ve delved into different lineages and ideas, learning from the people who inspire me most on and off the mat. 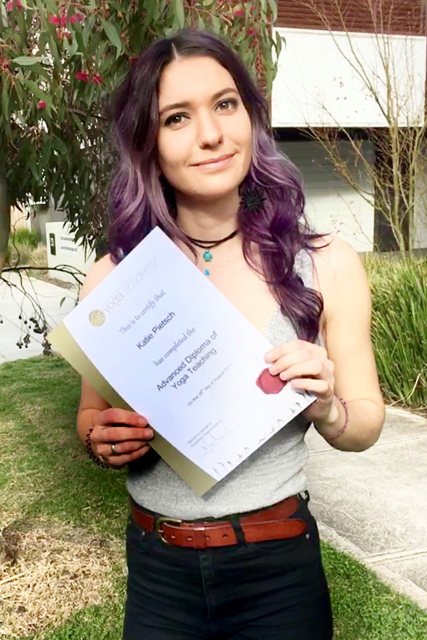 To date I’ve taught Yoga and Pranayama in Germany, South Africa, India, and Melbourne; completed my Advanced Diploma of Yoga Teaching with the Australian Yoga Academy, Yin Yoga TT by Karina Smith and Pilates TT with Studio Pilates. My creative aim is to facilitate an environment with zero judgement; where we can explore flows that are layered and challenge traditional poses and ideas to translate into our modern-day lives. My classes have a strong focus on the core, but most importantly, they are an eclectic journey that will always start and end with the breath, ‘prana’ – our life force.